Except for the last-minute wails of some right-wing Republican members of Congress including South Carolina Rep. Joe "You lie" Wilson, the long, costly and ineffective military policy of Don't Ask, Don't Tell officially ends when the clock rolls over to Tuesday, Sept. 20. HBO will air a "sneak preview" of its new documentary The Strange History of Don't Ask, Don't Tell at midnight Eastern/Pacific tonight before its official premiere Tuesday at 8 p.m. Eastern/Pacific and 7 p.m. Central. The film offers a comprehensive account not just of what's happened since DADT went into effect but of gays in military history in general dating back to 508 B.C. That date refers back to the Spartans, one of several historical groups or figures that through diaries and other documents have been shown to have had homosexuals in their ranks ranging from the famous such as Alexander the Great and Richard the Lionheart to the less-well-known figure Baron von Steuben, a Prussian captain who George Washington cited as a pivotal figure in the American victory in the Revolutionary War for a military training manual that he wrote. In fact, the U.S. military didn't have an official policy banning gays until World War II when top military officials, seeking an official reason to blame the increase in mental problems in veterans of World War I, decided to blame homosexuality. Even then, most were only discharged if commanders decided to make a case of it. Author and WWII veteran Gore Vidal speaks of the open homosexuality and how the higher ranks just chose to look the other way. When the war was ending and the military was looking to downsize, that was when gays started to be discharged, under what were called "blue discharges" instead of full-blown courts-martial, most being dumped in various port cities such as San Francisco, which is how the city ended up with such a large homosexual population. When the policy first began to be challenged legally was in 1975 when Air Force Technical Sgt. Leonard Matlovich sued and appeared on the cover of Time. He'd served two tours in Vietnam, been awarded the Bronze Star and a Purple Heart. After a long court battle, Matlovich actually won reinstatement and promotion in 1980, but the Air Force convinced him they'd find another reason to get rid of him or that he'd lose in the Supreme Court and offered him a financial settlement instead, which he took. He died of AIDS in 1988. His tombstone is in the Congressional Cemetery, but does not bear his name and actually lies in the same row as J. Edgar Hoover. 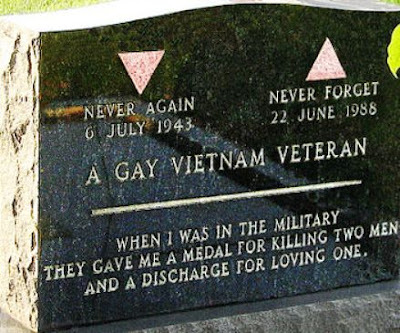 Matlovich meant it as a tribute to all gay veterans. Here is a photo of what he left for the world to read. Co-directors Fenton Bailey and Randy Barbato do an excellent job packing in a lot of information, admittedly much of which we've heard before, and placing it in an fast-moving, concise package that runs less than 90 minutes long. In addition to the facts and archival footage, they also have good interview subjects such as former U.S. Rep. Patrick Murphy, D-Pa., the first Iraq war vet elected to Congress, who also happens to be straight and married, who led the legislative fight to get DADT repealed and Aubrey Sarvis, executive director of the Servicemembers Legal Defense Network that led the lobbying effort and never lost his optimism as the chance for the repeal began to look bleaker and bleaker in the intransigent Senate. The documentary reminds us of some of the most infuriating effects of DADT such as the discharge of 54 gay Arab linguists who, if still on the job, might have translated al-Qaida chatter referring to 9/11 as the day for a big attack prior to it happening. Since 9/11 led to war and, indirectly, to the nonsense in Iraq, it's interesting to note that DADT discharges dropped starting in 2001 because they needed troops to fight in the two wars, though once tours of duties ended, they'd kick the troops out. It also reminds us of how much the lowered the bar for recruitment allowing felons into the military even people who had made terrorist threats. 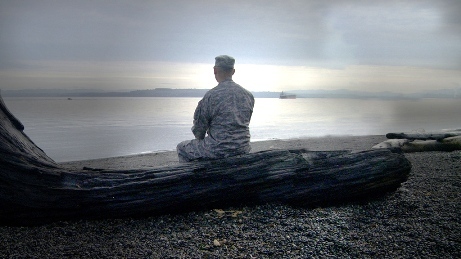 During the 17 years and three presidencies under which Don't Ask, Don't Tell was the policy, more than 13,000 active duty service members were discharged. The military even produced a comic book explaining what to do if someone was being harassed about being gay, but of course they couldn't go to a superior for fear of outing themselves. The Government Accountability Office this year computed the average cost for training a soldier to be $52,800. Between 1995-2009, the GAO puts the cost of Don't Ask, Don't Tell at $385 million. When debt-obsessed GOPers such as Michele Bachmann says she would reinstate DADT, she isn't be very deficit conscious, is she? One of the best moments of the documentary is reliving the Senate hearings and getting to hear Admiral Mike Mullen, chairman of the Joint Chiefs of Staff until his retirement at the end of this month, explain why he thinks the policy should end. "It is my personal belief that allowing gays and lesbians to serve openly is the right thing to do. No matter how I look at this issue, I cannot escape being troubled by the fact that we have in place a policy that forces young men and women to lie about who they are in order to defend their fellow citizens. For me, personally, it comes down to integrity — theirs as individuals and ours as an institution." To see the activists almost tear up even today hearing his words remains touching and it's comical to watch Sen. John McCain, R-Ariz., go ballistic, shaking a piece of paper he says contains the names of more than a thousand retired generals and flag officers opposed to repealing DADT as if he's Joe McCarthy with a list of Commies in the State Department. What I didn't know but that Aubrey Sarvis reveals is that most of the names on McCain's list were retired military men in their 70s, 80s and, in some cases, even dead. Sarvis points out that some on the list served in segregated ranks and wanted the military the way it used to be: all straight white males, not realizing they all served next to gay men and never knew it. It's not in the documentary, but I always remember McCain's predecessor in his Arizona Senate seat, Barry Goldwater — patron saint of the conservative movement who wouldn't pass muster with the GOP today with his stances such as being pro-choice. He didn't hold office, but he still was around during the original fight in 1992 when Bill Clinton promised to end the ban but had to compromise for the Don't Ask, Don't Tell policy. Goldwater, appearing on The Tonight Show, said, "You don't have to be straight to shoot straight." Perhaps the best moment of The Strange History of Don't Ask, Don't Tell comes as time is running out in the lame duck Congress in December 2010 before the new GOP House takes over to get the Senate to sign off on the repeal. With legislative maneuvering going on, Barbato and Bailey, aided by a great original score by David Benjamin Steinberg, direct the sequence as if it's a tension-filled suspense thriller. Whether you stay up late to watch this informative and compulsively watchable documentary at the moment Don't Ask, Don't Tell officially ends or wait to watch it Tuesday night in prime time, it is well worth a look. The Strange History of Don't Ask, Don't Tell airs on HBO tonight at midnight Eastern/Pacific and 11 p.m. Central and Tuesday at 8 p.m. Eastern/Pacific and 7 p.m. Central.